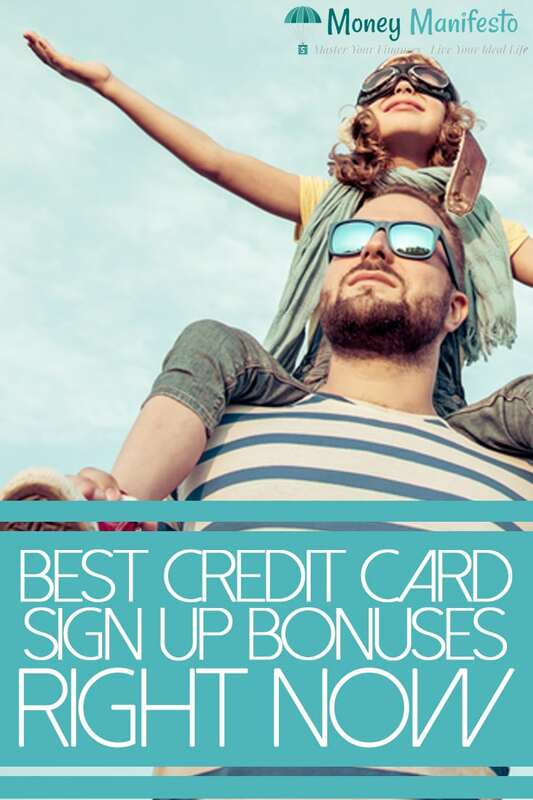 Sign up bonuses are one of my favorite ways to earn credit card rewards. Below you’ll find the best credit card sign up bonus offers I could find. There are currently some great credit card sign up bonus offers available. Some offers are worth over $1,000 or more. I personally have used many of these offers myself. First, you sign up for a credit card with a bonus offer. Then, you meet the various requirements within a time limit to earn the bonus. Sign up bonuses are normally awarded in some form of credit card reward points. You can usually use the points for statement credits, travel, gift cards or other rewards depending on each program. Each program values points differently so it is important to know your options before you cash out your sign up bonus. This can greatly alter the value of the credit card sign up bonus reward points so make sure you know what you’ll use your points for before you sign up for a particular sign up bonus credit card to get the best deal. This card is a great way to cut down on your travel costs. After spending $5,000 within the first 90 days of opening the card, you’ll get 70,000 bonus miles. The 70,000 miles can be used for a $700 travel statement credit. Additionally, you’ll earn 2 miles per dollar spent on all purchases. This means you’ll have 80,000 miles to spend after you meet the sign up bonus requirement. The card offers a 5% miles rebate on all miles earned, so after redeeming the 80,000 miles, you’ll have an additional 4,000 miles added to your account. The waives the annual fee in the first year, but does have an $89 annual fee each year thereafter. There are no foreign transaction fees and your miles won’t ever expire as long as your account is open and in good standing. Apply for the Barclaycard Arrival Plus World Elite Mastercard today. My wife and I recently used two of these credit cards to completely pay for a 7 day Carnival Cruise! Essentially, you’ll earn 50,000 miles after spending $3,000 in the first three months. You can then use the 50,000 bonus miles plus 6,000 earned miles on purchases to redeem your miles against $560 of travel purchases charged on your Venture credit card. You’ll earn two miles for every dollar in purchases you make no matter what category you make your purchases in, which essentially is 2% cash back when you redeem your miles for travel purchases. Your miles will never expire and there is no limit to how many reward miles you can earn with the card. Just to clarify, Capital One considers the following as travel purchases: airlines, hotels, railroad tickets, cruise lines, taxi cabs, car rentals, limo services, bus lines, travel agents and time shares. As an added benefit, you won’t have to pay foreign transaction fees and Capital One will provide you with your credit score monthly. There is no annual fee for the first year, but you’ll pay a $95 annual fee for each year after the first. 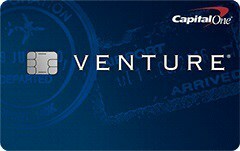 Apply for the Capital One Venture Rewards Credit Card today. The Capital One Savor Cash Rewards credit card offers a $500 cash back bonus after you spend $3,000 on purchases within the first 3 months from account opening. While this card technically isn’t a travel credit card, it’s a great companion to take on your travel adventures. This card is a diner’s dream by offering 4% cash back on dining and entertainment, two categories most people spend heavily in when they’re traveling. Additionally, the card offers 2% cash back on groceries and 1% cash back on all other purchases. There is no limit to the cash back you can earn and the cash back never expires for the life of the account. Additionally, this card has no foreign transaction fees. There is no annual fee the first year, but each year thereafter there is a $95 annual fee. 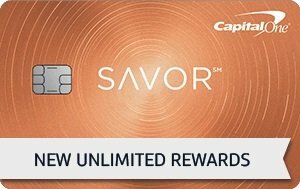 Click here to apply for the Capital One Savor Cash Rewards credit card today! Bank of America decided to step up to the plate and launch a premium credit card to compete with other banks when they launched the Bank of America Premium Rewards credit card. This card offers 50,000 bonus points after you make at least $3,000 in purchases within the first 90 days of opening your account. You can also get up to a $100 credit each year for airline incidental costs and an additional $100 for TSA Precheck or Global Entry once every four years. You’ll earn 2 points per dollar for travel and dining purchases and 1.5 points per dollar of all other purchases. But it gets even better. If you’re Preferred Rewards customer, you can get an additional 25%-75% rewards bonus on every purchase you make for up to 3.5 points per dollar on travel and dining and 2.62 points per dollar on all other purchases. There are no limits on the number of points you can earn and the points never expire. This card also offers no foreign transaction fees and travel insurance protection. There is a low $95 annual fee with this card. Apply for the Bank of America Premium Rewards Credit Card today. The Chase Sapphire Reserve is currently offering 50,000 Ultimate Rewards points for spending $4,000 within the first three months of account opening. Those points can be redeemed for $750 in travel credit through Chase Ultimate Rewards program. In addition to the sign up bonus, you get $300 in travel credit for purchases such as hotels and airfare each account year you own the card. You’ll earn 3 points per dollar spent on all travel and dining purchases and 1 point per dollar on all other purchases. Additionally, there are no foreign transaction fees with this card. Unfortunately, with all of these great benefits, there is a massive annual fee of $450 per year. You’ll definitely earn that back with all of the benefits this card offers in the first year, though. The Chase Sapphire Preferred credit card has a 60,000 point sign up bonus. You earn 60,000 bonus points after you spend $4,000 within 3 months of opening your card. The 60,000 points can be applied as a statement credit. Alternatively, they can be direct deposited into your bank account for $600 with each point being worth a penny. If you use the rewards through Chase’s Ultimate Rewards program you can get $750 worth of value on travel. However, there are some even better ways to use your 60,000 point sign up bonus. You earn 2 points per dollar spent on travel and dining purchases and 1 point per dollar spent on all other purchases. A couple of the other great benefits include no foreign transaction fees and the card has a chip for when you’re traveling internationally. They even have a customer service number answered directly by real humans. 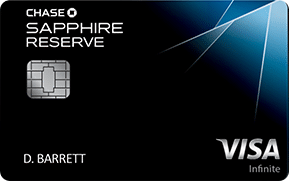 There is an annual fee of $95 for the Sapphire Preferred card. Apply for the Chase Sapphire Preferred credit card today! 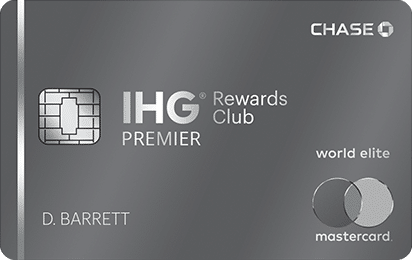 The IHG Rewards Club Premier Credit card currently offers up to 120,000 bonus points. Earn 80,000 points after spending $2,000 in the first three months after opening your account. Then, earn an additional 40,000 points after spending $5,000 on purchases in the first six months from account opening. After you spend $20,000 on purchases and make one additional purchase each account anniversary year, you’ll earn 10,000 additional bonus points. You will earn 10 points per dollar spent when you stay at IHG hotels, 2 points per dollar spent on gas station, grocery store and restaurant purchases and 1 point per dollar spent on all other purchases. Another amazing benefit is the free anniversary night, earned each anniversary, which can be used at hotels with a point redemption level of 40,000 points or less. You’ll also automatically earn Platinum Elite Status. You’ll also get a fourth reward night for free when you redeem points for any stay of 4 or more nights. The annual fee for this card is $89 per year. 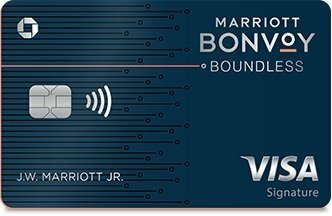 The Marriott Bonvoy Boundless credit card currently offers 100,000 points after spending $5,000 in the first three months of opening your account. You’ll get automatic Silver Elite Status as a perk for being a cardholder. Additionally, each year on your card account anniversary, you’ll earn 1 free night stay at a hotel with a redemption level up to 35,000 points. You can earn unlimited Marriott Rewards points with no maximum limits. You’ll earn 6 points for every dollar you spend at Marriott locations and get Silver Elite status. You earn 2 points per dollar spent on all other purchases, but there is a $95 annual fee for this credit card. If you fly on Southwest these cards offer some tremendous sign up bonus values! Both credit cards, the Southwest Rapid Rewards Plus and Premier, are currently offering 40,000 bonus points after you spend $1,000 on purchases in the first three months of opening an account. The 40,000 points can be redeemed for roughly $500 in Wanna Get Away?® fares which can be redeemed for a round-trip flight. In addition to the sign up bonus you earn 2 points for every dollar spent on Southwest Airlines® when you book directly with the airlines and 2 points for every dollar you spend on Southwest Rapid Rewards Hotel and Car Rental Partner purchases. All other purchases earn 1 point per dollar spent. 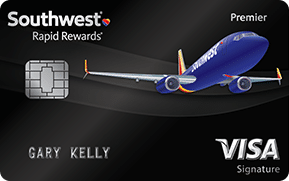 Both versions of the Southwest Rapid Rewards credit card have anniversary bonuses. The Plus credit card has a 3,000 point anniversary bonus and the Premier credit card has a 6,000 point anniversary bonus. The Premier version boasts no foreign transaction fees which can save you a ton of money if you commonly use credit cards in foreign countries. Unfortunately, both credit cards have annual fees. The Southwest Rapid Rewards Plus annual fee is $69 and the Southwest Rapid Rewards Premier annual fee is $99. If you use all of your points each year, the extra $30 for 3,000 extra anniversary bonus points is actually worth $40+ in Wanna Get Away?® fares so it might be worth it to splurge for the Premier card. 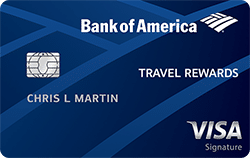 The Bank of America Travel Rewards credit card is a great basic rewards credit card with no annual fee. Simply spend $1,000 in purchases in the first 90 days of card membership and you’ll earn 25,000 points worth $250 in travel credits. You’ll also earn 1.5 points per dollar in purchases. That means you’ll have 21,500 points after you complete your sign up bonus spending. You can use your points for the following travel purchase categories: airfare, car rentals, hotels, airline baggage fees, campgrounds, cruise lines, tourist attractions, zoos, amusement parks and exhibits. You won’t have to pay any foreign transaction fees on this card and the points that you earn never expire. If you have a Bank of America checking or savings account, you’ll even get a bonus 10% extra points. If you’re a preferred rewards customer, you could earn a points bonus of 25% to 75%. Points must be redeemed in 2,500 point increments for a $25 statement credit against travel costs. Click here to apply for the Bank of America Travel Rewards credit card today! The Capital One VentureOne rewards credit card is a great option for those looking for a great sign up bonus and rewards card with no annual fee. This credit card will reward you with 20,000 miles, redeemable for $200 in travel credits, for spending $1,000 in purchases within the first three months. You’ll earn 1.25 miles for each dollar in purchases so you’ll actually have 21,250 points after completing the minimum spend required for the bonus on this card and your points don’t expire. This Capital One credit card has no foreign transaction fees, so it is a great card to take when you’re traveling abroad. As I mentioned above, there is no annual fee for this credit card. For that reason, it is great for people just getting started with credit card rewards. 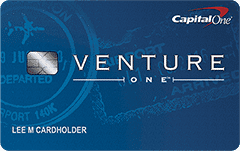 Click here to apply for the Capital One VentureOne rewards credit card today! New cardmembers can earn a one time $150 cash back bonus when you spend $500 within the first 3 months of opening your account. This card has no annual fee and offers a generous 1.5% cashback on all of your purchases. You can redeem your cash back at any time for any amount and your cash back never expires. 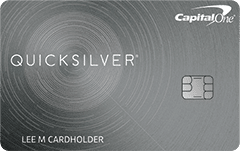 Click here to apply for the Capital One Quicksilver cash rewards credit card today! 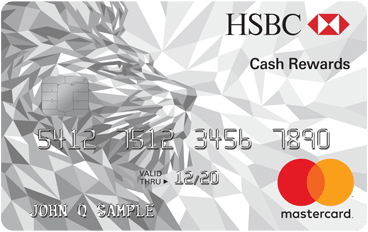 The HSBC Cash Rewards Mastercard offers $150 cash back after spending $2,500 or more in purchases in the first 3 months from opening your account. It also offers 1.5% cash back on purchases and a 10% anniversary bonus on all Cash Rewards earned each year. You don’t have to worry about annual fees or foreign transaction fees on this card, as there are none. Click here to apply for the HSBC Cash Rewards Mastercard credit card today! 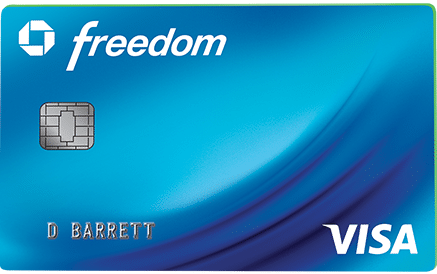 The Chase Freedom credit card currently offers $150 credit card sign up bonus after spending $500 on purchases in the first 3 months from opening your account. The Chase Freedom credit card allows you to earn 5% cash back on up to $1,500 in purchases each quarter in rotating bonus categories. To qualify for this cash back, you must activate your bonus each quarter. All other purchases earn 1% cash back. For January through March 2019, the bonus categories include gas stations, tolls and drug stores. This card has no annual fee. Click here to apply for the Chase Freedom credit card today! Many people think they don’t qualify for business credit cards. However, if you run any type of business, such as selling things on eBay, rent out a property or freelance write on the internet, you can try to apply for a business credit card. If you don’t have a business structured, chances are you would be classified as a sole proprietorship. In that case, you would use your social security number in place of an employer or taxpayer identification number. 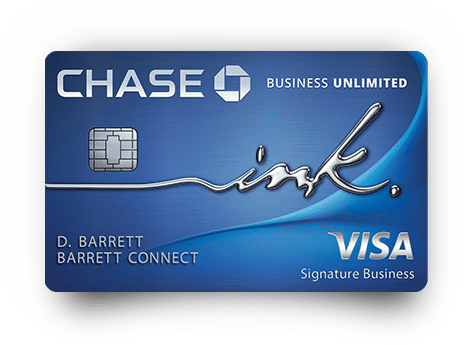 The Chase Ink Business Preferred Credit Card offers one of the largest sign up bonuses I’m aware of at 80,000 sign up bonus points but it comes with a large spending requirement of $5,000 in the first 3 months from opening your account. You can use those 80,000 points for $1,000 in travel rewards when redeeming through Chase Ultimate Rewards program. This credit card offers 3 points per dollar spent on the first $150,000 in combined purchases on travel, shipping purchases, telecommunications purchases (internet, cable and phone), and advertising purchases made with social media sites and search engines each anniversary year. You earn 1 point per dollar spent on all other purchases. It also offers no foreign transaction fees. There is an annual fee of $95. 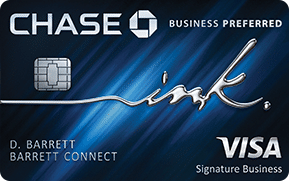 Apply for the Chase Ink Business Preferred credit card today. The Capital One Spark Cash for Business credit card offers a hefty $500 sign up bonus after spending $4,500 in purchases within the first 3 months of card membership. This card also offers a great 2% cash back on every purchase you make. Your rewards will never expire. There are no category limits and your cash back is unlimited. This card is really simple and offers great rewards for a business credit card. Additionally, this card has no foreign transaction fees. You can even get free employee cards if you wish! There is no annual fee the first year. That said, an annual fee of $95 per year kicks in after the first year. 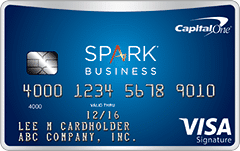 Apply for the Capital One Spark Cash for Business credit card today. The Capital One Spark Miles or Business credit card offers 50,000 bonus miles, worth $500 in travel credits, if you spend $4,500 in purchases in the first 3 months of card membership. This card is very similar to the Spark Cash card except it awards miles instead of points. Miles can be redeemed for travel purchases at a penny per point. You’ll earn 2 miles per dollar spent on all purchases regardless of what spending category they would fall in. There are no foreign transactions fees on this card. Your points never expire. You can also get free employee cards which are all super convenient benefits for business owners. The annual fee of $95 is waived the first year, but you’ll have to pay it each year after that. 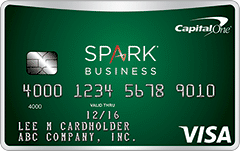 Apply for the Capital One Spark Miles for Business rewards credit card today. The Chase Ink Business Cash credit card offers $500 bonus cash back after spending $3,000 on purchases in the first three months after account opening. In addition to the bonus cash back, you’ll earn 5% cash back on the first $25,000 in combined purchases at office supply stores and internet, cable and phone services each account anniversary year. You’ll earn 2% cash back on the first $25,000 in combined purchases at gas stations and restaurants each account anniversary year, too. Finally, you’ll earn 1% cash back on all other purchases. There is no annual fee with this card. The Chase Ink Business Unlimited credit card also offers $500 bonus cash back after you spend $3,000 on purchases in the first 3 months after opening an account. This card offers a flat 1.5% cash back rate on all purchases which is nice if you don’t like confusing bonus categories. Credit cards can be great tools. They can make you a ton of money, if, and only if you play the game correctly. I ALWAYS pay my credit card off in full every month and you should too. If you can’t do this I would suggest against getting credit cards. If you have a problem with debt and/or credit cards I would suggest you not sign up for new cards. The cash back benefits do not outweigh the interest charges you will pay. What sign up bonus credit cards have you used in the past? Are there any other offers I should be aware of or add to my list? I’d love to hear your input below in the comments! Editorial Disclaimer: Opinions expressed on this page are mine alone, not those of any bank, credit card issuer, airline or hotel chain. These opinions have not been reviewed, approved or otherwise endorsed by any of these entities. The information in the article is accurate to the best of my knowledge as of April 3rd, 2019. It will be periodically updated as offers change. As with any offer, make sure to read all of the details on the application site. Those are the terms and conditions that will govern any credit card you sign up for. What you have read here is simply a summary and does not contain all terms and conditions. Last year i signed up for the Chase Sapphire Reserve when the sign up bonus was still 100,000 points for $4,000 spent in the first 3 months. I’d just bought a house and quickly spent 4k on furniture and furnishings, which I paid off as soon as I put them on the card. A few weeks ago I used my 120,000 points to buy myself and my fiance plane tickets to Kauai for our elopement – round trip tickets for 2 from West Virginia to Hawaii and my balance after our points were used up was $94. Such a win! The Capital One Venture Rewards credit card is a great one. My wife and I have that and it is great for racking up the miles quickly! Venture Rewards is where it’s at…as a frequent traveler for both work and pleasure it’s so easy to rack up miles. Churning takes some practice I haven’t quite gotten to that skill level yet. Re: Citi Thank You Premier Card-If you want cash back on eligible purchases you receive only .75 cents (3/4 of a penny) per point. Re: Delta’s 30,000 point bonus for opening account — You will not get the bonus if you’ve ever received the bonus before. It’s a once-in-a-lifetime offer. Thanks for sharing Mike! Hope your tips can help someone avoid a mistake! With the Chase Sapphire Preferred card, if I sign up and then add my wife as an authorized user and we get the bonus, can my wife then sign up as a primary and add me as an authorized user and also get the bonus? Yes! It’s amazing. My wife and I did that in the past. You will need to both get approved for your own primary cards though. Chase won’t disallow it for being an authorized user on another card as far as I know, but they will need your credit to meet their requirements to issue a primary to each person. Recently I heard they won’t approve you for a card if you’ve had more than 5 new credit card accounts in the last 24 months though, so if you’re close you may want to avoid adding that person as an authorized user. I recently signed up for Capital One Spark, as I am a Cap. 1 investor/checking member. I have a small Amazon business of selling products for resale, and got the $500 bonus as described after spending $4500 in the first month. I had to return a product and that took me below the sign-up bonus limit, and they haven’t revoked the bonus *crosses fingers*. Also, the Chase Marriott is a wonderful card, giving 50000 points to spend on Marriott Rewards stays. Thanks for sharing your experience. Hopefully you’re still in the bonus period if they do decide to take it away. Keeping too many credit card isn’t good for your credit score right ? Also if we use these cards for paying our bills ( apartment , phone) , do we still get points ?? As long as you don’t carry a balance, carrying more credit cards shouldn’t hurt your score in most cases. Of course, if all of the credit cards are new it could shorten your average age of credit which could slightly hurt your score. You do get points for almost any regular purchase. You don’t get points for cash advances though. Just make sure to never carry a balance. Is there a link for the Southwest Plus 50,000 bonus? The bonus on the website is still at 25,000.
thanks for your great blog!!! Great work on getting all that information together. I spend about $3K per month on my existing cards, I may have to do some travel hacking soon. Glad I could help. I normally update this post once a month with the latest and greatest, so make sure to check back when you’re ready to sign up for a credit card. It should probably be mentioned that the Citi ThankYou reward points can be transferred to partners as well. That seems to be a big hole in your recommendations. be careful with citi thank you card if youve had one before, they will issue you a card, but when you have met your minimum and ask for your sign on bonus, they will not give it. There definitely are rules if you’ve already had a card or received the sign up bonus for a card before. Make sure you understand if you are eligible for the bonus before you apply. Call the credit card company and verify if you need to. 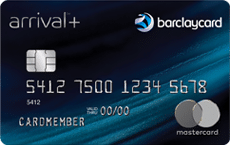 Currently I would say the Barclays US Airways Premier MasterCard with it’s 50,000 point sign up bonus is one of the best offers. The bonus is easily worth well over $500 dollars in flights. The card is being discontinued soon so act quick! It should also be noted that if you already have credit with Barclays and are denied for a card with them you can easily call them up and move some of your credit to get approved. I’ve only been 18 for 8 months and I just got the Barclays US Airways card along with their Arrival Plus (and the Chase Freedom) with the help of moving credit from my first card with them. In the past year and a half I got both the Southwest Premier and Signature cards when they each had a bonus of 50,000 points which they seem to offer a few times every year. When the combined bonuses and spending reached 110,000 points it also earned us a Companion Pass which has saved us thousands of dollars since my wife flies with me for free, even if I am paying with points! Then we got the Marriott Rewards card while it was offering a 70,000 point bonus. Our Marriott Rewards points were used to stay ten free nights in Marriott hotels over the past year, worth well over $1000. 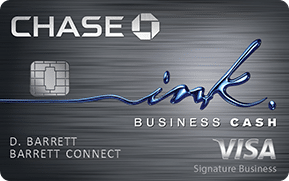 Most recently we started using the Chase Ink Business Plus card which was also offering a 70,000 point bonus that we will be able to use at Marriott hotels or on Southwest flights, or in many other places. It really pays to watch for those special offers! Special offers are really awesome. I try to keep these as up to date as I can 🙂 Hopefully they help! After the Sapphire my best card is the Venture its 40,000 bonus points for $3,000 in 3 months. Thanks Abey, I’ll have to consider adding that to the list. Personally, I think the Barclaycard Arrival Plus beats it out thought. Bank of America offers a 0% interest card ( less than 1 year) and they award $25 each calendar quarter if you pay more than the minimum ( $25) each month and pay on time. If you open a small Bank of America checking/saving account and have the $25 bonus credited to the account you get another $5. You must make these payments each month in a quarter to get the $30 at the end of the quarter. Time getting the card in order to start a new quarter of payments. Keep enough on the card @)% to owe a minimum of $25 each month, play this out until the 0% runs out and then pay the card off. Can get $120 a year doing this. Thanks for the comment Bill. This sounds really complicated though for such a small pay off compared to some of these other cards like the Barclay Arrival Plus. However, if this is what works for you, free money is awesome! 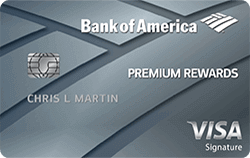 An easy way to use this BofA Balance Rewards card is to pay a small number of small recurring bills using the card. I have mine set up to pay 3 monthly bills automatically, totaling about $30 monthly. Paying the card balance in total every month is also automatic. Set it and forget it and get $120 a year. Not a lot of cash, but not bad for doing a few online transactions to set it up, and no annual fee. Love this. It took awhile to set up but now it pays for my Netflix subscription. The new Wells Fargo cards probably deserve a mention as well, $400 in cash + $100 in airline reimbursements. Thanks William, I’ll consider that in future editions. The card as a decent bonus but other than that it doesn’t look very compelling. I am trying to slowly ease my way into rewards cards. I did sign up for the Discover It card a couple months ago but haven’t used it yet. I just have this fear in the back of my head that I’ll buy more than normal with a CC. I am contemplating just charging any normal bills I can to it and then immediately logging in and paying it off so that I can rack up some rewards. I’d like to get the confidence to earn the big rewards. If you can handle it then that sounds like a good strategy, but if you’re worried about getting into trouble with credit cards then I would say no reward is worth potential credit card debt! I churn cards all year long.. It takes discipline, but makes me about 2k a year for doing nothing.. If it hasnt been mentioned here, its good to note that the best everyday card in the world (In my opinion) is the capital one spark business card. It earns 3% on EVERY purchase.. Not just gas. the only catch is a 99 dollar fee annually. actually, I lied.. Its 2% on every purchase.. Still not bad. Gordon, isn’t there an annual fee with that card? It’s good if you spend enough to make it worth it, but you definitely have to keep it in mind now that there are no fee cards at a flat 1.5%. 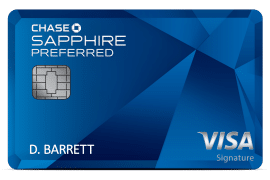 I got the email about that new Citibank card, but I have a Chase Freedom and a Chase Sapphire Preferred and love how those 2 cards work together! Hope you’re doing well 🙂 Love the site design!! I love credit card rewards. They are just so easy. Chase has had some pretty great offers lately. $500 for opening a Sapphire account is no small reward. If I was in the market for a new one, I’d seriously give that one a closer look. I have a United card and got a Continental card before the merger. I have added a business card over the years as well. Last year I got a Hilton card for the hotel stays. You can really rack up points on the card quickly. Racking up points is great but only if it didn’t alter your spending habits! I have churned almost all of those! I did the Southwest card this winter…but isntead of $800 in flights I took $500 in Walmart gift cards. Boring, I know, but it freed up $500 in my budget to throw at my mortgage. Right now we are churning Starwood Preferred guest cards for our trip to Europe next spring! Sweet deal! PCB and Europe within 12 months? Sounds good to me! And we’re going to Panama City in September too!